Forty years ago in August 1977, I established the Sea Shepherd Conservation Society. Today, thanks to supporters like you, we are an international movement. We have hundreds of dedicated volunteers that participate in ground campaigns all over the world, crew our ten ships on sea campaigns, and work to spread awareness about our organization in their local communities. Our Neptune’s Navy is actively stopping poachers on the land and in the waters of Mexico, Liberia, Gabon, the Baltic, Panama, Galapagos, Australia, the Mediterranean, the Caribbean, the Southern Ocean, and the North Atlantic. Our organization is saving lives and upholding international conservation law. Our important work is only possible because of our supporters - individuals who care about biodiversity in the sea and the protection of our oceans. I’d like to extend my deepest thanks to you for your generosity in supporting our life-saving efforts. As you know, if the oceans die, we all die. I am thankful that you are helping us save the oceans and the wildlife that call the oceans home. Sea Shepherd is doubling it’s efforts to protect the near-extinct vaquita porpoise. We are bringing more ships, drones and crew to patrol the refuge and arrest the illegal fisherman. An independent group has begun efforts to capture this elusive creature, to which Sea Shepherd is vehemently opposed. Captivity doesn’t protect, it kills. One of Sea Shepherd’s primary focus will be the detection and deterrence of IUU fishing activity. IUU fishing undermines efforts to conserve and manage fish stocks, and greatly disadvantages those fishers that follow the laws and fishing guidelines. Complicated systems of trans-boundaries, coupled with the fact that operational resources of many regional Coastal States are already stretched thin, is why IUU fishing is so prevalent. When Hurricane Irma and Maria devastated the Caribbean Islands, the M/V John Paul DeJoria headed to the area to provide aid by working with such organizations as the Red Cross, UNICEF, GlobalMedic, YachAid Global and many more. Sea Shepherd was able to provide everything from water, to tarps, generators and pet food to some of the most hard hit islands. The M/V Martin Sheen continued our invaluable scientific research program, including studies such as researching toxicology on cetaceans in the Gulf of California, the migrating patterns of humpback whales in Mexico’s Archipelago of Revillagigedo, the levels of micro-plastics in those same waters and the toxic reality of farmed Salmon in the Pacific Northwest and British Columbia. Sea Shepherd believes education is one of the primary keys to the survival of our oceans. Our crew-members and on-shore volunteers, conduct presentations to school children around the world, teaching them about the importance of ocean conservation and a healthy marine eco-system. These children will one day be the stewards of the oceans and the understanding and empathy they learn now, will be a direct factor in the decisions they make to protect the ocean. In 2018 Sea Shepherd has even more critical life-saving missions planned. During Operation Milagro IV, we will continue our campaign to save the critically endangered vaquita porpoise. We will expand our sea turtle defense campaign, Operation Jairo, into other areas. 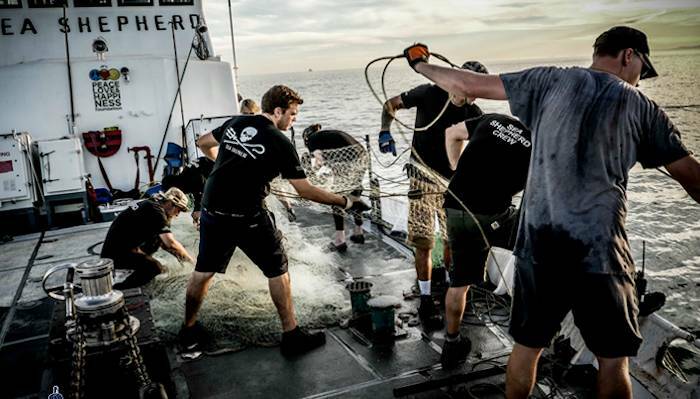 In addition, Sea Shepherd will focus on battling illegal, unreported and unregulated fishing, which is decimating the world’s oceans, including protected and endangered species.